The Bancroft Library's new Edward Hellman Heller Reading Room. Photograph, 1973. 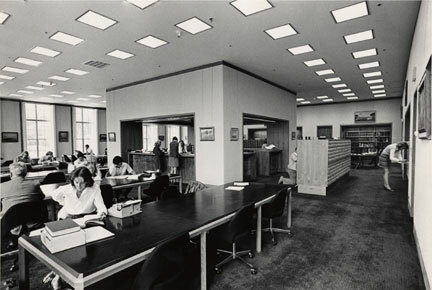 In remodelling its Annex quarters, The Bancroft Library acquired added space so that its new divisions could share one stack and one reading room as well as have common space for offices and technical services. For the first time, the library also had permanent gallery space where its treasures could be exhibited.